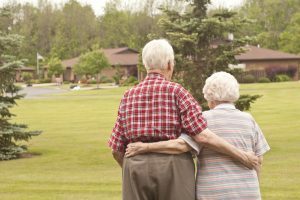 Our community provides a wide variety of comfortable living options for a variety of needs including: skilled nursing, memory care, rehabilitation services, assisted living and independent living. Three meals per day plus snacks. Daily assistance with activities of daily living (ADLS), i.e. dressing, bathing, ambulation, personal hygiene and needs. Administration of medications as prescribed by attending physician. Individual activities programming for residents (Memory Care). 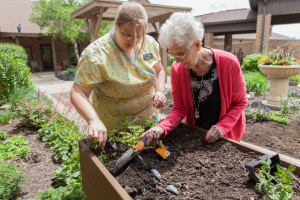 Interested in learning more about our Skilled Nursing Services? Contact our Social Services Director. Efficiency or 1 bedroom units available. Personal care assistance (bathing, grooming, etc). On-site beauty and barber shop. Cable TV and high-speed, fiber optic internet. Speech, occupational and physical therapy. 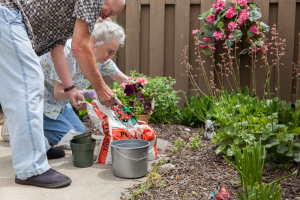 Interested in learning more about our Assisted Living Options? Contact our Assisted Living. Spacious one-bedroom apartments (570 sq ft). Located inside the main campus building. Convenient access to Three Oaks Café. Wellness room with treadmill, elliptical machine, weights, resistance devices, and more. 1 car oversized attached garage space. Outdoor patio space with privacy fence. Grounds and unit maintenance provided. Use of Christian Care facilities including Wellness and Activity Center. Spacious 2 and 3 bedroom villas. Multiple kitchen floor plans with upgrades available. Four season room or storage unit options. 1 and 2 car attached garage space. Restaurant style meals at the Three Oaks Café inside main campus building. Beauty and barber shop inside main campus building. Cable TV, high-speed, fiber optic internet, and telephone service. Interested in learning more about our Living Options? Contact our Independent Living.